Dangerous GRE Vocabulary: Re- Doesn’t Always Mean Again! In this video, we are going to talk about word roots. 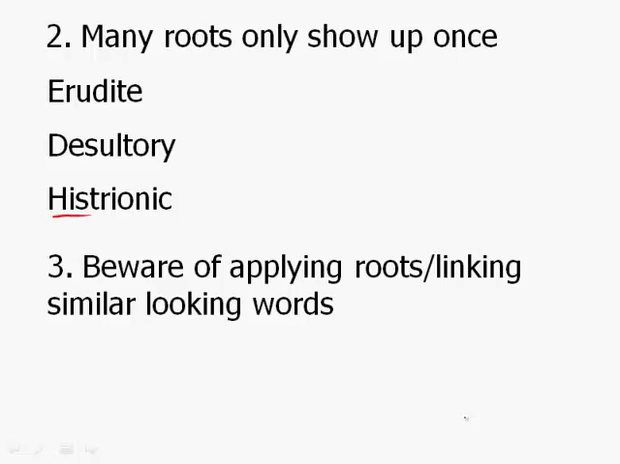 Now you may have heard in your GRE research that you've done so far that word roots are great to learn vocabulary. Now this isn't entirely true. And in fact, for the GRE, I would say it isn't true at all. roots are good for beginners: especially people who just learned English, or maybe fifth, sixth, seventh graders who are trying to build up their vocabulary from childhood simple words to more advanced words. And so what these students usually learn are roots such as mal-, 'cause it's if you stick mal-, which means bad, in front of a word, it makes these other words something bad. Malign, to say something bad about someone. Malicious, to have and that's great. Put the root there and everything is wonderful. Look at this. Magna, magna means large. Same thing. Magnanimous means life, like animate. If you are large-lifed, it doesn't mean you have a great time at the party but it means you are big-hearted and kind and generous you can forgive people, you don't hold grudges, you're a nice guy, you're magnanimous. And an erudite is an actual scholar. So you have this root that only shows up once and so if you were to learn the root as well as the definition, it really wouldn't help you much. Because, again, you can't apply erud- the way you applied mal-. Other examples: desultory. Desultory comes from a person who, basically, jumped from horse to horse in the circus. So it comes from jumping, desult. Again, there's no other word that has that root. So you're learning a root but you should just really learn the definition what does desultory actually mean - it means rambling, unfocused, and so you can see that sometimes the roots don't - even if you know the roots they don't directly relate to the definition. And then histrionic. What happens here is we say, "Oh, look, history." And it sounds like history. And therefore we think histrionic means relating to history. Histrionic actually comes from histrionicus, which means pertaining to an actor in Latin. Again, there's no other word in the English language and surely not history that has this definition. What it actually means though is not of or pertaining to actors, but theatrical in the sense that your reactions are overdone, overblown, melodramatic. And so, again, the root doesn't quite match up and you don't even see the root again. And the word itself looks Like another word that's not related to the root at all. So you can see now that the GRE, yes, they're kind of evil in the sense that they know that many English words are confusing 'cause they make people think, "Oh, it must mean this," when actually it doesn't. And I wanna give you some more examples. You wanna be aware of taking something like hist- and thinking, "Oh, it must mean history." And here are some common pairs that people get wrong all the time, such as ponderous versus ponder. And I'm gonna be focusing on to ponder, and I think many people know this word, to ponder means to think something over carefully, to contemplate. So ponderous is someone who contemplates, and that's actually incorrect. Ponderous means moving with great effort, you're weighed down, you don't move gracefully. So you can see that's different from "ponder". But if you just were going on your knowledge here and said, "Huh, this looks like a root from this word," You'd actually be mistaken. Another example - prodigal and prodigious. Some people know this word, not everyone, but some people know this word because of the Bible. There's this whole story about the prodigal son. The prodigal son basically spent all his dad's money he was wasteful and now we get this wonderful adjective prodigal, which means wasting all your money. And the word prodigious shows up on the GRE and you say, "Hey, it must be related to prodigal." But it's actually not the case. You get many similar looking words in English that you think will be related, but actually aren't related. And so sometimes we try to extract these roots that we think are roots but they're similar-looking parts of the word such as pro and pro, but the meaning is actually very different. So let's go on now to another aspect of roots. And I've been bringing in a lot of bad news with roots, but roots can make for good back stories. Remember desultory? Well desultory means jumping from horse to horse. Remember that's the circus person. And hence, if you jump from subject to subject, or if you're not organized, or working in focused manner you're desultory. So this could be memorable in of itself. It's not necessarily a mnemonic, but it's a good story that, hey, this word comes from a person, I guess they actually have these people in circuses who jump from horse to horse. So once in a while, there's a good back story on it. And to find good backstories go to online etymology dictionary, which is at etymonline.com Again, not all words have great back stories but once in a while you'll encounter a few and definitely on the vocab Wednesdays I will make note of interesting roots and words, so if you ever see Vocab Wednesday, which is on Youtube or on our blog (magoosh.com/gre) I encourage you to look there. I'll sometimes point out again these interesting back stories to words. Now more good news, in fact, great is that, not all roots come out at the beginning of the word like magnanimous, magna-. Or even at the middle of the word, but they actually come at the end are at the end are known as suffixes. So let's take a look here. You may have never seen this word before: magnaminity. However, based on something else, based on another word you've seen in this video you should be able to figure out the definition of magnanimity, because, again, suffixes only come at the end, they only change the part of speech word and not the meaning. So what does "magnanim" look like? Aha, it looks very similar to magnanimous, which is an adjective. If you can remember, again, it means having a big heart, you're generous and you're kind. And so magnanimity with the "ity" is simply the noun form. Let's take a look here. Erudition. You've probably never seen this word before, but you have seen erudite. And again, erudite is scholarly or learned. Erudition, therefore, is the noun form. Notice it just changes here at the end, -ion. It doesn't change the meaning but it changes in a sense the part of speech with our addition, maybe shifts it a little from the actual person to the knowledge itself. And mal- means bad, so not skilled. And then when we add -ness at the end. Which again, comes at the end: suffix. It's only affecting part of speech, when you add "ness" it changes adjective into a noun and maladroitness is the quality of being clumsy. So basically clumsiness. Now, lets take one final word in the parts of speech category, a word that actually hasn't come up in this lesson video yet. And you may say, "Oh, I've never seen that before. I see 'fun' is fun a root? No, fun is not necessarily a root. But again, we're dealing with parts of speech, therefore we're dealing with suffixes, therefore we are dealing with the end of the word. Funereal, looks very similar to what other word? If you just drop the last two letters? Well, funeral. And so funeral is a noun, but if you want to change that into an adjective So if something is depressing, really this atmosphere around you, if you're in a classroom or wherever you happen to be, again, if it's gloomy and depressing, then you can describe that as funereal. Key take away, the change comes at the end of the word. It usually doesn't change the meaning it just changes the part speech and that's where roots can really help you, kind of at the back of the word, not so much in the beginning or the middle the word. Now, finally, there's gonna be a lot of these confusing words. Again, I try to mention these as much as possible on the vocab Wednesday posts or in the videos, but even in our vocab ebook I have all these confusing pairs, confusing trios, etc. And you should definitely go through that. But it's never exhaustive. Sometimes what's confusing for you may not to be confusing for another person, or for even me. So it's always a good idea to turn these confusing confusing words that you encounter, words that look similar but mean something different, turn these into flashcards so you can always have them handy and really come up with ways to make sure that you separate the definitions of one word for the definition of a word that may look similar, but is very different. And that takes us to the end here, so I guess really to recap: roots aren't this magical savior. Typically the GRE picks words that, kinda, or picks words that look similar as though they have the same the same roots to throw us off. But in general, learn a few of the basic roots if you don't know them already. Don't try to guess based on unknown information, or two words that kind of look similar. And finally, remembering the ending, the suffix. It's gonna help you remember a lot of words in different parts of speech.